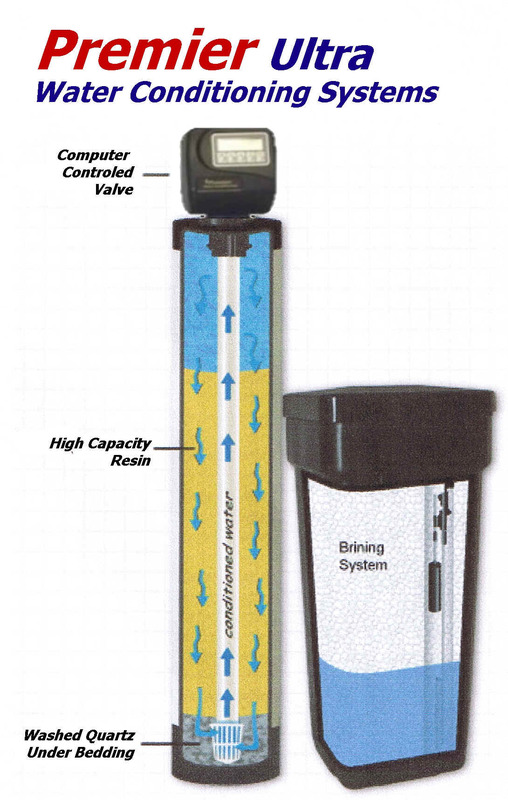 The Premier Ultra water softener system can flow up to 27 GPM. The Premier control valve can be utilized in both 1.0" and 1.25" configurations and this systems features a maximum resin capacity of 32,000 grains. Our advanced diagnostic system monitors all system functions and automatically determines when it needs to regenerate the resin media bed, based upon present and past usage and predicted needs. 27 years of uninterrupted daily use. Uses only the amount of Brining needed to clean the specific volume of exhausted resin. This makes the Premier series of conditioners the most efficient water systems today. Lead-Free Piston design uses genuine Teflon coatings to further enhance longevity and durability. All system settings are permanently stored and will never change during power outages. During electrical interruptions, a capacitor back-up is used to maintain the time of day and gallons remaining, therefore there's never a need to replace or dispose of old batteries. Control valve is machined from inert Noryl, a glass reinforced composite material developed for outdoor UV applications. The control valve's environmental cover is NEMA-3R rated to withstand both cold and wet climates.